Extreme weather events such as severe thunderstorms, ice storms, blizzards, windstorms, tornadoes and hail are part of life in Canada, but these hazards are becoming increasingly frequent and intense as a result of climate change. Both the current impacts and future risks associated with extreme weather events demand climate adaptation policies, courses of action designed to reduce the vulnerability of communities and strengthen their capacity to cope with weather-related impacts. At the end of this report, we outline major recommendations to support the development of Canadian climate adaptation policies at the community level, and identify ways in which the federal and provincial governments can facilitate and support these local actions. A central focus is disaster risk reduction, meaning reduction and, where possible, prevention of loss associated with extreme events. Specific attention is devoted to two policy fields—emergency management and infrastructure planning—that are particularly sensitive to extreme weather events. 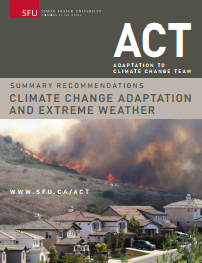 The recommendations outlined here are drawn from a more comprehensive companion report, entitled Climate Change and Extreme Weather: Designing Adaptation Policy, which is available from Simon Fraser University’s Adaptation to Climate Change Team (ACT). Extreme weather events are a hazard for Canadians and their property, and can severely damage the infrastructure systems that support life in communities. The Intergovernmental Panel on Climate Change’s Fourth Assessment Report, issued in 2007, projects a number of climatic changes for North America that will contribute to more frequent and intense extreme weather events in Canada. As the climate warms, there will be an overall global increase in precipitation, but for some locations, such as the southern Prairies and the Interior of British Columba, there will be summertime decreases in precipitation. Warmer temperatures will bring more summertime evaporation, resulting in water shortages and a reduction in lake levels. In most areas, extreme precipitation events will occur more frequently than in the past. More rapid and extensive snow-melt associated with rising temperatures, and increasingly intense rainfall associated with summer storms, could heighten the flood risk in many Canadian communities. Warmer surface air temperatures could increase the frequency and extent of wildfires and could lengthen the wildfire season. More intense winter storms are anticipated for mid-latitude regions, suggesting that major ice storms could become more common in the future. Sea level is rising faster than was earlier projected, meaning a greater risk of inundation on low-lying lands, beach erosion, increasing salinity of freshwater aquifers, and intense coastal flooding resulting from storm surges associated with more intense storms. A number of recent extreme weather events in Canada indicate that climate change is already starting to make its effects felt by Canadian communities. • Severe flooding in the Saguenay–Lac-Saint-Jean region in southern Quebec in 1996 destroyed more than 1,000 homes, required the evacuation of 16,000 people and caused damages in excess of $800 million. Manitoba was still recovering from its second worst flood in 1997, which cost $817 million, when in the spring of 2009, it experienced its third worst flood ever. At one point, more than 700 square kilometres were flooded. • The ice storm that struck eastern Ontario, southern Quebec and parts of the Maritime provinces in January 1998 was responsible for 28 deaths and over 900 injuries, and the estimated total costs associated with the disaster exceeded $5 billion. Island communities. Damage was estimated at $20 million for all areas affected by the surge. • In 2002, a violent rainstorm of a magnitude seen on average once every 100 years drenched Peterborough, Ontario. Two years later, an equally extreme downpour ravaged the town’s homes and businesses with what the CBC called “the flood of the century.” An unusual cluster of tornadoes caused a third devastating event in August 2005, costing Peterborough and the province upwards of $100 million and having a significant impact on residents. • The Canadian Wheat Board estimated that the 2002 drought resulted in production losses for grains and oilseeds of nearly $2.8 billion. Crop insurance payments hit a record level of $803 million in the first nine months of 2002, an increase of more than 300% when compared to the five-year average. • In August and September 2003, disastrous fires caused by drought and extended hot weather in the Kelowna region of British Columbia forced the evacuation of 45,000 people and destroyed more than 300 homes, with a total cost of $700 million. The summer of 2009 was even hotter, and the risk of forest fire was again extremely elevated with evacuation alerts affecting over 17,000 people. At one point, Premier Gordon Campbell warned that “the wildfire risk is at the highest level in recent memory, with 85 per cent of the province facing a high or extreme fire hazard level. • In August 2005, an intense rain event in Toronto washed out a major street and also flooded many basements. Insurance payments to homeowners totalled about $500 million, the largest insured loss event in Ontario’s history. In August, 2009, several tornadoes wreaked havoc across Southern Ontario and led to the death of an 11-year-old boy, prompting premier Dalton McGuinty to call for better extreme weather warning systems. Environment Canada did issue a call one-half hour before the tornado struck Durham, but the warning failed to reached area emergency services. • In 2006, a severe windstorm ripped through Vancouver’s world-famous Stanley Park, damaging 40% of the forest, flattening 3,000 trees and costing $9 million to repair. Heavy rains increased turbidity in the city’s water supply, prompting a boil-water advisory that lasted more than a week. The return period of extreme weather events—the estimated interval between occurrences—will be shorter in the future. Damage from climate-related catastrophes like those listed above has cost Canadians billions of dollars in the past few years, and both climate scientists and insurers predict that the toll will increase unless preventive actions are taken. Climate change is also expected to result in more extreme warm temperatures in all parts of Canada. For example, the Canadian climate model projects that by 2050 the number of days with a maximum temperature above 30°C will increase in Victoria from one to about five; in Calgary from five to almost 20; in Winnipeg from 14 to nearly 50; in Toronto from 12 to 35; and in Fredericton from eight to about 25.3 In the summer of 2009, Vancouver experienced two of the hottest days in recorded history, at 34°C and 34.4°C. 1.1 Share information and coordinate adaptation policies and programs. efficient adaptation measures for existing infrastructure, including the risk of more frequent and intense extreme weather events. 1.3 Partner with professional associations to mainstream adaptation principles into the work of practitioners. 1.4 Examine the role of insurance in climate adaptation for extreme weather events, and map out solutions to the challenges insurers face in developing products to support climate adaptation. build resilience to future risks. 2. The Government of Canada should establish a Climate Action Centre, which, through partnerships with provincial and municipal agencies, will focus national attention on climate hazards and promote adaptation planning. 2.1 Review and adjust current human and financial resources allocated to observation and monitoring to ensure that comprehensive and high-quality climate and weather information and projections of changes over periods of hours, days, seasons, and decades is collected, analyzed and disseminated to provincial agencies and communities. Data analysis should include updating recurrence intervals based on recent observations and rehabilitation of time series, particularly with respect to tide gauge data. ensure that timely warnings of climate hazards and information on protective actions are delivered to emergency response organizations and individuals. 3. Provincial and local governments should incorporate climate adaptation principles into infrastructure design and land-use planning decisions in order to reduce exposure and vulnerability to extreme weather events. Local governments should assess both their current vulnerability to extreme weather events and the risks posed by climate change, including sea level rise, and should develop an adaptation strategy, using risk management as a framework to prioritize actions targeted at climate-related risks. 3.1 Incorporate climate adaptation as a priority in official community plans. 3.2 Ensure that resilience to future risk is anticipated in new development by requiring climate adaptation planning as a precondition for development approvals. 3.3 Prioritize actions to reduce vulnerability of existing infrastructure. distributing infrastructure such that it is not singularly vulnerable to extreme weather events; and recovering water, energy and other resources rather than relying on new supplies that can be affected by extreme events. 3.5 Plan and test procedures to evacuate people from areas at risk, to minimize the exposure of residents during an emergency. 3.6 Plan for the continuity of municipal services during an emergency and for increased demand from residents. 3.7 Establish a public hazard education program to inform citizens and key stakeholders about extreme weather events and the protective measures they should take to reduce their vulnerability.